The Bermuda Triangle, also known as the Devil's Triangle, is a region of the northwestern Atlantic Ocean in which a number of aircraft and surface vessels are alleged to have disappeared in mysterious circumstances which fall beyond the boundaries of human error, pirates, equipment failure, or natural disasters. Popular culture has attributed some of these disappearances to the paranormal, a suspension of the laws of physics,(The Philadelphia Experiment/Project Rainbow ) or activity by extraterrestrial beings. 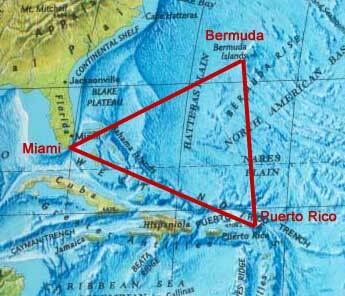 Less known, on the other side of the world, there exists a similar area of ocean known as the Dragon’s Triangle. 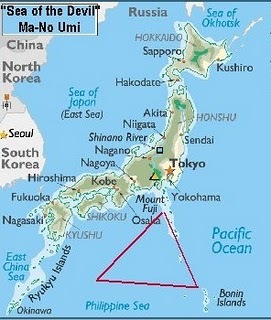 The Dragon’s Triangle follows a line from Western Japan, north of Tokyo, to a point in the Pacific at approximate latitude of 145 degrees east. It turns west south west, past the Bonin Islands, then down to Guam and Yap, west towards Taiwan, before heading back to Japan in a north north easterly direction. Both areas share stories of missing maritime vessels and aircraft, reports of malfunctioning navigational and communication equipment and tales of drifting, crew less ghost ships.